When Sir Roger Penrose visited Silicon Valley this spring, he stopped off at Google, NASA, and the Rainbow Mansion. But he spent most of his time at Rainbow, Silicon Valley's answer to the 17th-century French salon. Penrose — the English mathematical physicist renowned for his work on general relativity and cosmology — gave a talk in the Rainbow library, touching on black holes, Hawking radiation, and the unitarity principle. And he spent the night in a Rainbow guest room, leaving plenty time for the lighter side of theoretical physics. That evening, Penrose and his hosts watched Contact, the 1997 film based on the Carl Sagan bestseller, in which Jodie Foster discovers intelligent life beyond earth. "One of the central plot points is that the protagonist goes through a worm hole," says David Weekly, a former Rainbow Mansion resident and the founder of online collaboration start-up PBWorks. "I heard some soft chuckles on the couch next to me." 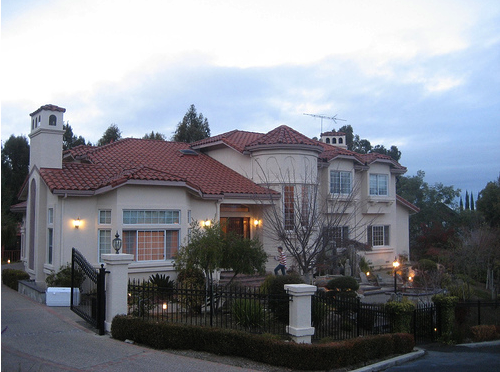 Rainbow Mansion is a place, a house in Cupertino, California, not far from Apple headquarters. But it's also a community, a kind of science and tech society. It was founded four years ago by current NASA chief technology officer Chris Kemp and four other Young NASA Turks, and it soon embraced other like-minded locals, from former Google senior product manager Jessica Ewing to Sebastian Stadil, CEO of open source cloud computing startup Scalr and the founder of the Silicon Valley Cloud Computing Group, to various other Googlers and, yes, a few members of Steve Jobs' top secret Apple army. The mansion has a communal library, and every few weeks, it hosts what residents call, yes, a salon. The last was entitled: "This house believes that in the future the benefits of openness will outweigh those of privacy." The next: "This house believes that Nationalism is an Infantile Disease." Guest speakers range from Penrose to Lawrence Lessig to Steve Wozniak. One Rainbow founder — Will Marshall, who worked on the NASA LCROSS project, the mission that discovered water on the moon — counted Penrose as a PhD adviser. Rainbow was founded out of necessity. In 2006, several new NASA employees needed a place to live, and communal living was the cheapest option. It's a common story in Silicon Valley, where rents are high and house prices are higher. But this story is a bit different — if only because the people are different. In 2006, Pete Worden took charge of NASA's Ames Research Center in Mountain View, and he made a point of bringing in fresh blood. "It was a time of change at NASA," Chris Kemp tells The Reg. "[Worden] was intent on bringing in some folks that had different backgrounds and diverse views on space policy." As a college intern at SGI in the 90s, Kemp had worked at a field center at NASA's Marshall Space Flight Center in Huntsville, Alabama. But he'd also made a name in the dot.com world, serving a chief architect of that late 90s icon Classmates.com. It was Kemp who eventually negotiated NASA's partnership with Google, which led to the online image services Google Moon and Google Mars — and saw Google founders Sergey Brin and Larry Page and CEO Eric Schmidt use AMES as their own private airport. Later, he founded Nebula — the NASA IT infrastructure cloud, designed to host web services across NASA and various other parts of the federal government — and this spring, after serving as CTO at Ames, he assumed the same role for all of NASA. Will Marshall was hired by NASA at about the same time as Kemp, and the two spearheaded the creation of Rainbow. Kemp wrote the first check. Originally, all the residents worked for NASA, and most were PhDs who knew each other from past lives. "We're all connected by friendships that go back many years, mostly back to our days as undergrads and various space-centric conferences," says Kemp. "But none of us had lived in Silicon Valley before, and the one thing we could agree on is that it was really expensive to live here, so we wanted to find a place where we could figure things out together. But it actually turned into something more."